The prevalence of Old World Cutaneous Leishmaniasis in the Mediterranean region is increasing and in Southern Europe often caused by Leishmania infantum. Spontaneous healing of cutaneous leishmaniasis is commonly observed, especially if caused by L. major, whereas L. infantum associated lesions have been reported with longer disease duration and decreased tendency for self-limitation, however, available information is sparse. We report the case of an otherwise healthy woman from Southern Spain who presented with a seven years persistent, non-healing, painless, central ulcerated, nodular cutaneous lesion with a diameter of 2 cm of the forearm. Cutaneous leishmaniasis was diagnosed by smear and histology, showing large amounts of leishmania amastigotes in subepidermal histiocytes and extensive lymphocyte and plasma cell inflammation. L. infantum as the causative pathogen was confirmed by restriction fragment length polymorphism and microsatellite-PCR. Systemic or visceral involvement was excluded by negative leishmania serology and clinical presentation, relevant concomitant diseases or immunosuppression were excluded including quantification of immunoglobulin levels and lymphocyte phenotyping. Topical and systemic anti-infectious treatment options, often limited in terms of efficacy, tolerability and long lasting treatment duration, were considered. Treatment was successfully performed by surgical extraction in local anaesthesia only. To our knowledge this is the longest reported duration of a L. infantum associated cutaneous leishmaniasis indicating a potential long lasting natural evolution of the disease in an otherwise healthy and immunocompetent patient, however, high parasite density may have reflected a lack of a L. infantum specific immune response. Complete surgical extraction can be successfully performed as treatment. The prevalence of cutaneous leishmaniasis (CL) in the Mediterranean region is increasing and the variety of causative leishmania species is diversifying possibly due to worldwide travel and migration, increase of animal reservoirs, and climate change favouring the spread of the phlebotomine sandfly vectors . Mediterranean Old World CL (OWCL) can be caused by three different Leishmania species. In Europe, CL is usually associated with zoonotic Leishmania infantum infection with domestic dogs as a main reservoir. CL caused by anthroponotic L. tropica is common in Western and Southern Asia and has been reported from Greece but not from other parts of Europe [1, 2]. L. major infection has a zoonotic reservoir in rodents and is absent in Europe but a common cause of OWCL in North Africa, Middle East and some regions in Subsaharan Africa . High prevalence rates of L. infantum in asymptomatic human carriers from Southern Europe indicate that the disease might be of greater public health relevance  as L. infantum can also lead to life threatening visceral leishmaniasis (VL) especially in individuals with underlying immunosuppression such as patients with HIV infection. Spontaneous healing of OWCL is commonly observed after several months, especially if caused by L. major [1, 2, 4], and has been associated in animal models with the development of specific T helper cell Th1 immune responses . L. infantum associated OWCL seems to have longer disease duration associated with a decreased tendency for self-limitation, however, available information is sparse. Clinical presentation and histology of the Leishmania lesion. 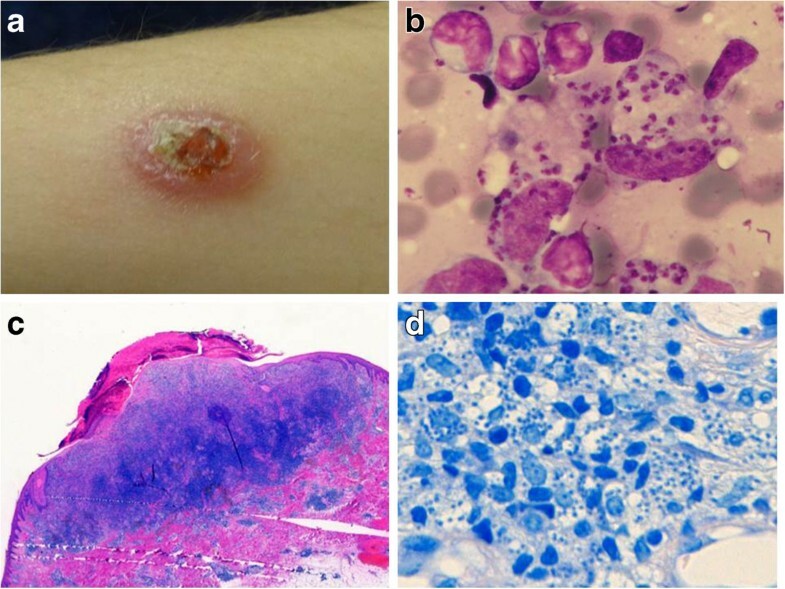 (a) Ulcerated, nodular lesion on the left forearm, (b) Leishmania amastigotes in a biopsy smear (Giemsa stain), (c) excised ulcer with subepidermal lymphocyte and plasma cell inflammation (HE stain), (d) large amounts of Leishmania amastigotes in histiocytes (Giemsa stain). After a thorough discussion with the patient about therapeutic alternatives such as cryotherapy, topical antimony therapy, or systemic chemotherapy, it was decided to perform a total excision of the lesion in local anaesthesia, taking into consideration its small size and long duration as well as an imminent business trip of the patient. Follow-up visits after 11 months showed complete healing with a minimal residual scar. This case represents to our knowledge the longest reported duration with seven years persistence of a L. infantum CL indicating a potential long lasting natural evolution of the disease in an otherwise healthy and immunocompetent patient. OWCL caused by L. major usually heal within 2–8 months, and lesions in L. tropica infection often heal spontaneously within one year . Cases of chronic, non-healing cutaneous or mucocutaneous leishmanisis caused by L. infantum have been reported mostly in patients with HIV or immunosuppressive treatments, or in patients with atypical clinical presentations such as relapsing CL, leishmaniasis recidivans (LR) or mucosal localizations [8, 9]. A maximum duration until spontaneous healing of up to 3 years has been reported for typical L. infantum OWCL lesions in immunocompetent patients . In Turkey, Cukurova region, a CL focus initially linked to L. infantum by PCR-RFLP, transmitted by Phlebotomus tobbi was described and patients presented mostly with small, non-ulcerative lesions which lasted for at least 2 years with only few cases of spontaneous healing . As in our case negative leishmania serology was seen in these patients which is probably typical for CL cases caused by L. infantum. Recently the causative Leishmania strain from this region was revealed by whole genome sequencing as a natural hybrid between L. infantum and L. donovani , indicating that diagnostic molecular methods might have some limitation for species differentiation. Unfortunately, we were not able to isolate the parasite in our case into culture for further specification and origin detection. As reviewed by Peters and Sacks  chronic or progressive leishmaniasis has been associated by the parasite’s ability to evade macrophage defense mechanism such as killing by oxygen-derived free radicals, to produce defects in the induction and expression of cell-mediated immune mechanisms such as suboptimal T-cell receptor (TCR) signaling and the inability of Leishmania-infected macrophages to produce IL-12 as the main inducer of IFN-y and CD4+ T cell Th1 differentiation resulting in defected cellular immune response. Furthermore it was speculated that the regulation of adaptive immune responses by CD25 + Foxp3+ T regulatory cells in the skin downregulate parasite-specific immunity allowing Leishmania species to establish chronic infection. It is speculative if such mechanism applied in our case, either caused by the host’s local immune characteristics or special phenotypic properties of the parasite itself – such as the hybrid strain from the Cukurova region - evading immune control. Lack of immune control in our case might be supported by high parasite density seen in histology and smear. For OWCL, several topical and systemic treatment options are available. However, all have substantial limitations in terms of efficacy and tolerability . For L. infantum CL there are currently no randomized, placebo-controlled treatment studies available to guide treatment decision. Small observational studies and case reports have described treatment success with intralesional antimonials, cryotherapy or oral triazole antifungals [12–14]. Other systemic treatment options such as pentavalent antimony, pentamidine, amphotericin B or miltefosine should be reserved for complex or complicated disease because of the risk of significant toxicity. In uncomplicated OWCL presenting as a single lesion of limited size (<4 cm of diameter) surgical excision has also been applied successfully , which was also confirmed in our case. Dr. Gabriele Schoenian from the Institute of Microbiology and Hygiene, Humboldt University, Charité, Berlin for performing microsatellite-PCR leishmania diagnostics. AK wrote the manuscript, lead patient management, data collection, analysis and discussion of results; IK participated in data collection and discussion; GB lead diagnostic laboratory procedures, TL suggested important intellectual content, discussion of results and participated in manuscript writing and review. All authors read and approved the final manuscript.